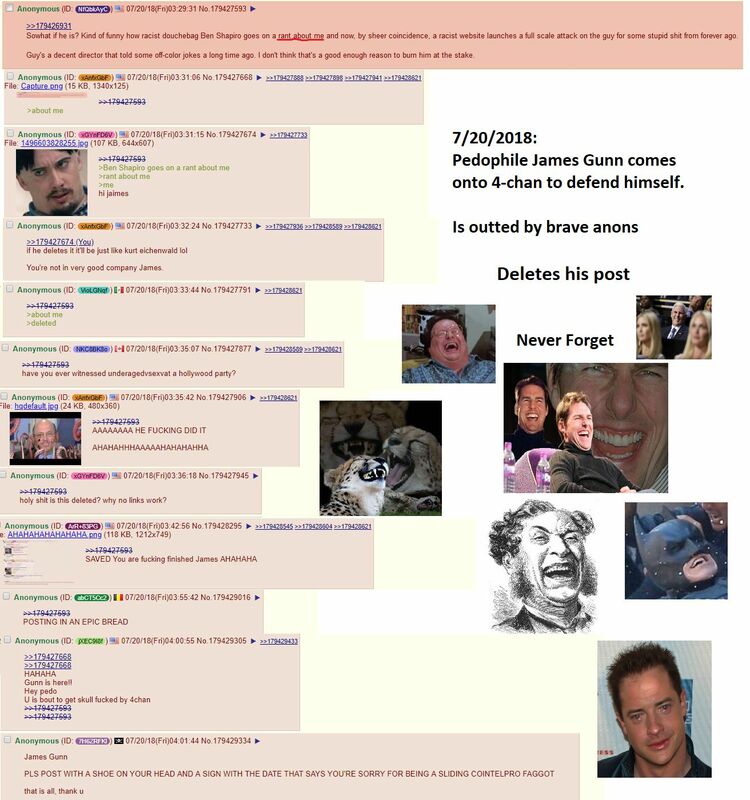 Something big started to unfold late last night/early this morning across the #chans regarding Guardians of the Galaxy director James Gunn, and #Anons took to immediately archiving everything they could find. So what were some of these tweets? But was he really just being a provocateur? (Note: I’m cutting up a much larger infographic here for readability purposes). Not looking too good, Gunn. Now, I haven’t gone to this link, and I will not be going to this link. Other anons said that it’s “just” a lewd song sung by these girls, with no pornographic content. It’s hosted on Youtube, and is supposedly really just that, a bawdy, lewd song sung by young girls for that extra dose of shock. It’s in bad taste, but it’s not a crime. No, the story gets interesting here because of where James Gunn found the video in the first place; more specifically, who shared the video with him. But guys, really, James Gunn was just joking with all of us. He said so himself. Years of tweets like this, and hanging in social circles with pedophiles – that’s not indicative of a pattern of behavior, no! It’s just… comedy! Could be a LARP, but a hilarious one at that. Gunn is going to get thrown under the bus by the highers ups, because make no mistake, MANY are involved in the exact same kind of thing. They’re just not vocal about it. But the really shocking thing about all of this is that it was public for years – almost a DECADE. It wasn’t hidden. It wasn’t relegated to some darkened corner. Disney HR could (and probably did) check Gunn’s social media before giving the higher-ups the greenlight to have him helm their mega-projects. But this is the sickened culture of #Hollywood, and it really is just another #OpenSecret.